The Communists certainly did a good job of preventing pollution didn’t they? Chernobyl, for instance? And that was REAL pollution! The reason to overthrow Capitalism is for them to be the world’s jack-booted thugs with everyone dependent upon them for your daily ration of nothing. My late brother, a chemist and director of the Prairie Grasslands for the International Biological Program in the 1970’s made a trip to Poland. He described it as dirty and totally broken down. Since the overthrow of the Community Bloc, things have certainly changed and Poland is a shining example of what Capitalism can do for people. Should anyone want more recent examples: Cuba today, Venezuela and San Francisco. Yup. Didn’t notice many people climbing over the wall to get into East Germany. The people climbing the wall to the West were missionaries coming here to spread the holy word of prophet Marx. It’s bizarre that he thinks communism would miraculously cure the planet. Especially when all available evidence suggests the latter. We have been trying to extricate ourselves from that curse ever since. Thanks to prophet Marx we are fast closing in on capitalism, as Lenin, Stalin, Mao, Castro, Maduro, Pol Pot, Ceacescu and the North Korean genius have shown. There is more hope than ever now as the islamists, Occasional Cortex and Omar (who brings to us the lates advances the breakthrough science of islamo-marxism. I still have to laugh over the pictures–in Life Magazine, I believe in the late ’60’s or early ’70’s–which perfectly illustrated “central planning,” USSR style. An apartment building had just been built scrupulously following the plans from the central architect. The facade showed balconies for each apartment, but with neither a door nor window to allow access to the balcony. You NEVER questioned the central government, you just did as told. An example of the opposite, is renowned architect Frank Lloyd Wright’s iconic Falling Waters house cantilevered over Bear Run in PA about 40 miles from my home. Wright had a tendency to design a bit ahead of technology. His team of architects on site (Wright was headquartered in New Mexico) to oversee the construction of the steel and concrete structure saw a problem. They ignored some of Wright’s specifications, adding more steel and basic structure to the structure. Had they not done so, Falling Waters might literally have fallen into the waters which flows below the home. Although it requires constant maintenance due to its environment, it still stands are truly a wonder and more beautiful than practical. Built for the Pittsburgh department store Kaufman family, it is now owned by the Western Pennsylvania Conservancy and open to the public. A globalist tool will never remove captialism, in that fisrtly it has never existed, we have had a limited free market with state sponsored monoplolies since before Charles 1st, and Adam Smiths diatribe(An Inquiry into the Nature and Causes of the Wealth of Nations) was railling against this practice, next every single communist movement et al has been sponsored by agencies run by rich globalist banksters. Added to the mix is rampant tribalist corruption where the aim is to get any relative into a position to looot the public purse and you have just about every government. There is not a communist movement without a bank backer, and who owns the banks. Yes it is all about moving more private assets and your life into the hands of the powerful, just about every communist party was founded and funded from within either UK territories or European monarchies, where they then exported themselves to their home nation. Did the SIS stop the Indonesian Communist party in 1939 when it was founded in Hong Kong, or did Germany stop Lennin,Stalin and Trotsky founding their socailist movements being exiled from Russia and Germany funded his return in 1917 after the UK with MI5(1909) allowed for decades the Russian Congress to operate openly in London, it costs a fortune to operate a politcal party, even more to buy arms ammunition etc to pursue a coup. And how on earth were Lennin, Trostky and Stalin able to enter and leave the UK. What sort of nation allows itself to harbour revolutionary groups dedicated to the overthrow of their country of origin ? theres a name for such states. Well we always said he was Moonbat, but it turns out that he isn’t that sane. I always stuck up for him. – many said he wasn’t good enough to dig ditches, but I said he was. What more would you expect from a Guardian columnist? Surely it’s capitalists who fund research into renewables; and provide the materials and equipment that generates renewables. He doesnt know what capitalism is. After all, we currently have Social-corporate-creditism in the West. Adam Smith wouldnt recognise our societies as capitalist. They’re not built on capital but on credit, with state credit, direction and regulation that promotes corporate monopolies. Our State tax system promotes credit (loan credit is tax deductable) but punishes capital (equity investing is taxed). Capitalism was abandoned long ago for our current semi-socialist nirvana. George Monbiot’s father, Raymond, was chairman of the Conservative party, so I cannot understand why he harbours such revolutionary thoughts. It seems odd that so many revolutionaries come from establishment backgrounds. It’s as if they are somehow ashamed of their privilege and have to atone for it. on the other hand perhaps they hope to lead the revolution and achieve great power.. I remember it being said that every Labour party minister was a failed Tory, in that great houses since the civil war of 1641 have had a son in either camp so whichever horse wins the family only loses a son, not its wealth. If this loon studied the underbelly of communism he could not possibly think that it is a panacea – he is but a useful idiot for the cause which he does not understand.. Finally the mask slips and the true agenda is revealed. Global warming was just a cover. But then we knew that all along. And Frankie Boyle? Since when did he matter to anyone in the real world. PP, you are so correct. Not everyone thought that Communism (in all its varieties) died in 1989/90. It just crept under various fig leaves, waiting for its moment to pounce. t has probably never entered their minds that overthrowing capitalism will not lower atmospheric CO2…faster, slower, or at all. No continued “dire warnings” nor any amount of geoengineering, can do that quantitatively, long-term. It’s so much easier to continue the charade…making money while doing it. I really believe that they don’t give a rip about lowering atmospheric CO2. The whole global warming issue is nothing but the latest weapon to be used to destroy capitalism and implement global socialism. When science finally wakes up and realizes the error – that CO2 doesn’t cause global warming – the socialists and communists will laugh and say so what? It got us what we wanted – an issue that brought down capitalism – and that in itself made the lie worth it. Never forget that for them the ends justify the means. Curiously, one of Monbiot’s contemporaries at Oxford was Claire Perry, whom he apparently described in one of his Guardian columns as “a firebrand who wanted to nationalise the banks and overthrow capitalism”. Yet she went on to work for Bank of America, McKinsey & Co. and Credit Suisse. One might wonder why the banks would employ someone with such views, unless of course they did scant research before offering her a job. On the other hand, she seems well-placed at present to advance her cause, based on her plan to eliminate C02 emissions entirely by 2025. Moonbat is just that, it’s the likes of claire perry and the clowns whom purport to run the shop UK ship – who really frighten me inclusive of mrs maybot. Actually, he doesn’t seem to be advocating communism, just the end of capitalism. I’m not sure if there are any other alternatives though. Still, the guy is quite obviously batshit crazy, I notice that in his deluded mind some kind of climate meltdown is a given. Do non of these climate catastrophists even look out of their window? Socialism the world over has failed. It certainly always failed to help the poor, it always assists to elevate the socialist elite to dictatorial success and excess. Very well said Tomomason…And quite true. Today in the US there are more than a few presidential candidates using that old worn-out “renewable” political gambit. “Promise them anything?” Promise them a new climate with fewer weather dangers, less extremes. Nothing to worry about if “we” Just act now before it’s too late. Never mind the time it might take nor the huge costs. The “1%” will pay for it. Absurd…indeed the “socialist precious lie”. Sadly they judge the poorer in comparison to the richer. In the UK people are judged to be in poverty if their household income is less than 40% of the median income. This means if the better off get richer, then the median income increases, automatically pulling more into poverty without any change in their individual circumstances. So the poor are not getting poorer in reality, just poorer in comparison. There is no real poverty in the UK today – only relative poverty. To find out what the real thing was like try reading some autobiographies from those who grew up in the 30s and 40s. I read Eric Sykes’s and often all he had to eat as a child was bread and dripping, and that was very common for a large proportion of the population in towns and cities. When I grew up in the 60s soft drinks and crisps were a treat not something that was part of the weekly shop as it is today. We had squash mainly. I wonder how the lefty loons at Novara get to watermark BBC2 /Zeppotron/Endemol content? Screeching eco-loons are all the rage these days. The crazier the better it seems. Monbiot is known, accurately, as the ‘Moonbat’. Safe to ignore and waste NO time reading anything he ever wrote. The most batshit crazy look I’ve ever seen. The refusal of Marxists to give up on their delusion is that so many of them are academics. They imagine that becoming a Marxist is part of a profound intellectual process – when in fact it is little more than a thought free adoption of a fashionable pose. Their adherence to this poisonous ideology is imbued with intellectual vanity and accordingly they would see the world burn rather than admit they are wrong. for once, I support tax funded “free” valium for all leftists. why are his eyes about to pop? is it the surprise valium dart that just hit his behind? 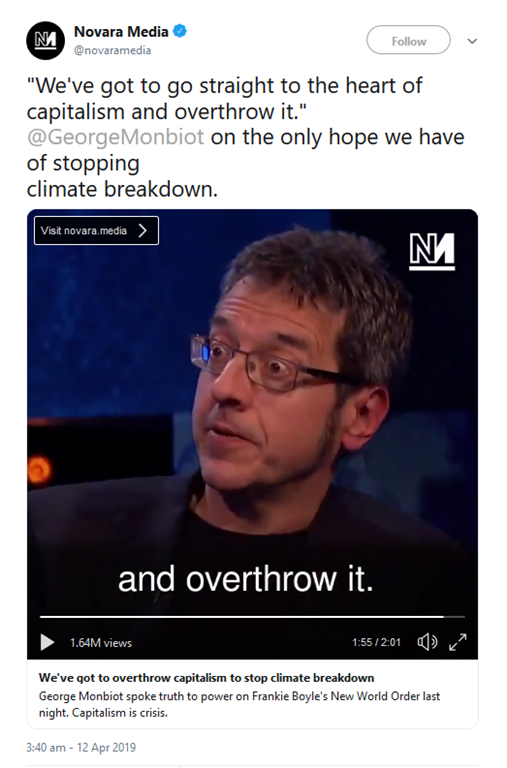 Best to ignore Monbiot, he is batshit crazy and do you really need the spike in blood pressure? We’ve Got To Overthrow Socialism, go to it’s heart, prevent them SPENDING OTHER PEOPLES’ MONEY! Abolish all ‘green’ taxation, abolish all ‘green’ subsidy. Revoke all ‘Carbon Tax’ statues. The BBC are very much in the way of, “The end of the world is nigh”, today. I am having trouble with why we vote when policy is being conjured elsewhere? Activism in this country has never been at such heights. Is it because such are overly tolerated by authority, the romantic language and concepts propagated by the Internet not confronted? The idea of the peoples’ representation has gone beyond the ballot box with politicians seen as part of the problem. Yesterdays demonstrations in London looks like “Passport to Pimlico”, when, fancifully, a borough proclaimed independence; it was in echo of the Paris Communes. It seems that these people are actually demonstrating against local conditions, having their city appropriated by the well to do leading to not having reason to tolerate anything, why not be disruptive it has no bearing on us. London is just too big for general rules relating to lifestyles and has become a powerful lobby of a particular mindset. Wealth is demonstrating the sting in its tail. Being surrounded by it, by the obvious in your face success of others, breeds resentment and the manufacture of causes unrelated to jealousy or bewilderment may well be a means, as they see it, of levelling the playing field, the tail wagging the dog. Perhaps when we get back to real government (perhaps even a smaller population. The ‘Black Death’ and its ravages promoted possibilities, offered freedom to the surviving underclass). What Mombiot actually rails against is the inflated sensibilities of a certain level of representation, the ‘think they don’t haves’ stoked by errant observations and money tree policy. Now whether the ‘don’t have’ would actually be sanguine if they did have is an issue that only their lack of optimism allied to poor expectation, if changed, can address. Why not be disruptive if you feel you have nothing to lose? You would expect such demonstrations to find mimics in India and China if there was an essence of truth in here somewhere. But in such places there is expectation and that is the opiate of the masses.’ London’s conspicuous wealth is a story of failure? Re the demo in London, I was amused to see that these environmentalists are using a large pink plastic boat, but the logic of this escaped me.. They suddenly became very confident. Confident enough to promote more and more their marxist utopia as the solution. Notice that there is about a 50/50 balance now between them broadcasting how little science they know and their solution which is world communism. I wonder how long before they give up on their climate nonsense and just concentrate on their real agenda which is world control. I was also having a thought about the raving looneys in extinction rebellion. Let us imagine if they get their way. The whole Western 20th and 21st century way of life is based on hydrocarbons and the population growth to 7 billion people (which is also mad). How many people do you think the world could sustain if we were forced by these rubber room reservation holders to give up hydrocarbons? My point is that it is their very own insanity which would cause an extinction possibility. How many billion would need to die to go back to their medieval nirvana? 5 billion. 6 billion? It’s still wrong as long as there are unelected Fat Cats at the centre, no matter what labels are stuck on it. Notus Beni: Tricking by false alarm and removing boundaries is an easy way to take over your neighbours garden. It’s crazy that a fictional unmeasurable invisible entity christened Sae-Oh-Too is now part of a mass indoctrination/ hypnotic mind control structure.